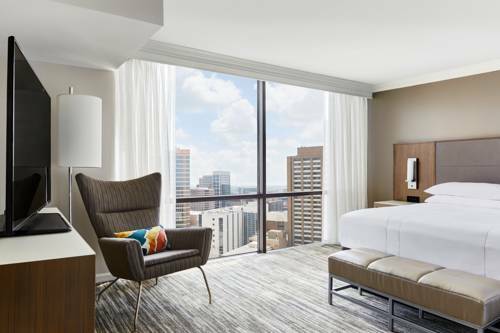 Enjoy thoughtful services and upscale amenities at Marriott Houston Medical Center. Situated on the MetroRail and across the street from the largest medical center in the world, our hotel provides incredible convenience to top health care institutions including MD Anderson Cancer Center, Texas Children's Hospital and Houston Methodist Hospital. After visiting the Med Center or attending a conference, appease your hunger with regionally-inspired cuisine paired with premium libations at our on-site restaurant, Driscoll's. Retreat back to ultimate relaxation in our newly remodeled guest rooms or concierge lounge. During free time, discover attractions such as the Museum of Natural Science, Houston Zoo, Hermann Park and Rice University, all less than 2 miles away. Whether you're planning an elegant wedding, educational session, or business meeting, we boast five stylish event rooms with nearly 9,000 sq. ft. of combined space. Travel brilliantly by making a reservation at Marriott Houston Medical Center today! Our casual restaurant near M.D. Anderson offers delicious, regionally-inspired cuisine freshly prepared to order. For those with special diets or restrictions, our chefs will be happy to accommodate your needs. Avaliable for private events. Relax over cocktails, beer, a glass of wine or other regionally-inspiried cusine at our contemporary lounge. Also available for private events. - University of Houston: Go Coogs!